Ever hear of Grapeshot, Eloqua, Moat, Hubspot, Krux, or Sizmek? Probably not. Maybe you've heard of Doubleclick, AppNexus, Adsense or Addthis? Certainly you've heard of Google, which owns Doubleclick and Adsense. If you read scientific journal articles on publisher websites, these companies that you've never heard of will track and log your reading habits and try to figure out how to get you to click on ads, not just at the publisher websites but also at websites like Breitbart.com and the Huffington Post. Two years ago I surveyed the websites of 20 of the top research journals and found that 16 of the top 20 journals placed trackers from ad networks on their web sites. Only the journals from the American Physical Society (2 of the 20) supported secure (HTTPS) connections, and even now APS does not default to being secure. I'm working on an article about advertising in online library content, so I decided to revisit the 20 journals to see if there had been any improvement. Over half the traffic on the internet now uses secure connections, so I expected to see some movement. 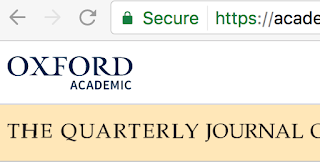 One of the 20 journals, Quarterly Journal of Economics, now defaults to a secure connection, significantly improving privacy for its readers. Let's have a big round of applause for Oxford University Press! Yay. So that's the good news. The bad news is that reader privacy at most of the journals I looked at got worse. Science, which could be loaded securely 2 years ago, has reverted to insecure connections. The two Annual Reviews journals I looked at, which were among the few that did not expose users to advertising network tracking, now have trackers for AddThis and Doubleclick. The New England Journal of Medicine, which deployed the most intense reader tracking of the 20, is now even more intense, with 19 trackers on a web page that had "only" 14 trackers two years ago. A page from Elsevier's Cell went from 9 to 16 trackers. Despite the backwardness of most journal websites, there are a few signs of hope. 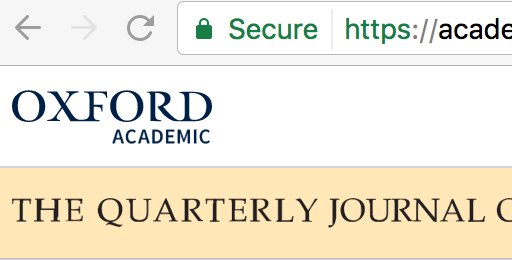 Some of the big journal platforms have begun to implement HTTPS. Springer Link defaults to HTTPS, and Elsevier's Science Direct is delivering some of its content with secure connections. Both of them place trackers for advertising networks, so if you want to read a journal article securely and privately, your best bet is still to use Tor.